Chocolate might be one of my favorite things in life. Truly. Add a little soft caramel to the chocolate, and it is definitely one of my favorite things in life. I love Caramello's, Twix bars, and really anything else that fits into that category. Yum! The day I first beheld the "Homemade Twix Bars" pin, my little heart about burst with the excitement. This had to be too good to be true! Ironically, it sat on my baking pinboard untouched for an entire year. Yikes, people! Thus you have the whole reason I am doing this series. The recipe is admittedly a bit more complicated then I prefer in this season of small children. Unwrap an entire bag of individually wrapped caramels, anyone? Proceed to slowly melt the sticky, thick mess on your stove top? Fortunately they were delicious. One batch fills a 9x13" pan, so you get your time and money's worth too. 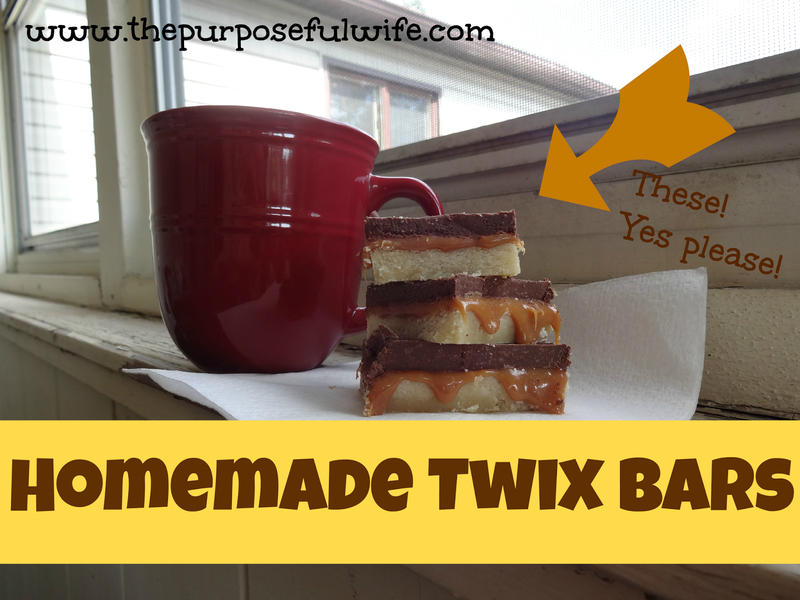 They didn't taste nearly as much like a Twix bar as I expected, but my husband said they tasted more like a Twix than he expected. Funny, huh? Just goes to show that everything is a matter of perspective. While they didn't quite satisfy my longing for a Twix bar, they were still extremely tasty. I probably won't be making them too frequently because of the effort involved, but I am glad to say that this was another successful Pinterest experiment. So glad I can finally, one year later, have Homemade Twix Bars checked off of my list!